Welcome to the Back To School Blast hosted by This Flourishing Life, Tailor Made Momma, and Generations Of Savings. 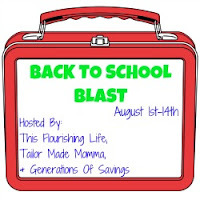 This event features items for all of your back to school needs. Each blog participating is giving away a prize or prize pack with a minimum value of $25, and the hosts are giving away prize packs with a total value of $1000! Here at Mom of Two Mischievous Monkeys we are giving away a Lovable Labels Back to School Pack. As you can see from the picture below a certain someone was quite excited to receive her labels, especially since with such a unique name she rarely gets to have personalized items. With 10 different designs available and 45 different icons, there are many possibilities to express your child's personality too! She loved getting to pick out her pink labels with the heart icon. Having used some of the these labels for Karensa's items in preparation for back to school, I am hooked. This is so much easier and convenient than my old method of labelling. And I absolutely love that these labels are dishwasher safe. The press n'stick clothing labels will hold up through the washer and dryer (with no ironing needed, although they offer those labels I remember all too vividly from my childhood too). My absolute favourite item from this pack was the shoe labels and the press n'stick clothing dots. They made labelling these items so easy. If you are not lucky enough to win the giveaway below and would still like some labels, I have a coupon code for my readers that will save you $5 off any order of $25 or more until September 30th! Just enter BTS201204 at checkout. Check out the pictures below of the various items we were able to label using our Back to School Pack. Enter on the RaffleCopter form below for my giveaway and be sure to hop around and enter the other contests available. And if that is not enough, don't forget to enter the Grand Prize Giveaway! 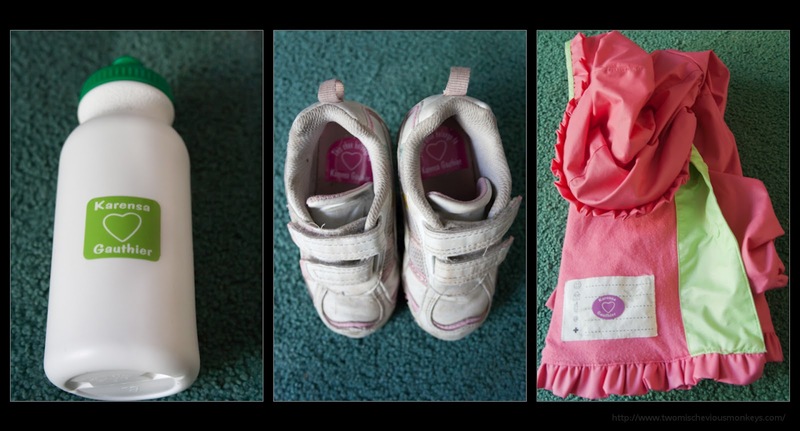 I think the Toddler Toes are cute - a great idea for putting on the kids belongings for daycare. I like the Name Sticker Labels. Thanks for the chance. We like "Movin' and Groovin'"
I like the mini-metal tags - nature lover. I like the polka dot me stickers. I like the fun stickies Crown labels. I love the Mini Metal Zip It tags! I like the traditional iron-on labels. I like the ZIPIT! Tags. I like the Diva Stickers. I like the fun stickies labels. and i also love the bag tags the round metal tags and i also love the multi purpose square labels!